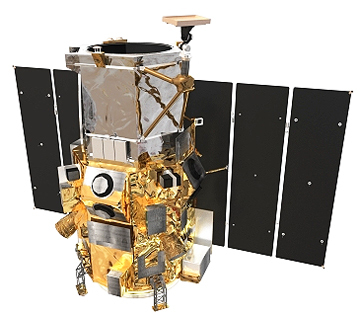 Artistic rendition of the GeoEye-1 satellite. Company information. ....millions of square kilometers of high-resolution satellite imagery to the Russian Federal Service for State Registration, Cadastre and Cartography (Rosreestr). Russia, the world’s largest country, covers more than one-ninth of the Earth’s land mass and spans nine time zones. To efficiently administer the property rights and data across this vast landscape and make this information accessible, Rosreestr is creating a countrywide base map of land properties in the Russian Federation. The base map will have multiple data layers including orthorectified high-resolution imagery, cadastral information (for example, type of ownership, permits, licenses, rights, restrictions, transactions and taxation) and extensive topographic features (natural features representing boundaries). The Russian government will host the completed base map on their portal for viewing by federal and regional government agencies and the public via web services. The first phase of the contract includes a significant delivery of GeoEye-1 archive imagery to ScanEx. In the second phase, in 2012, GeoEye will collect new imagery of Russia from its GeoEye-1 satellite.